All transactions are safe and secure with a reliable history in online purchasing behind each of our associates. 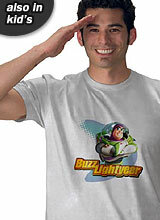 Buy the Arms Crossed Buzz Lightyear t-shirt to own Toy Story clothing and merchandise. Buzz Lightyear flew onto the scene when he was given to Andy as a birthday present. Oddly enough, unlike the rest of the gang, Buzz does not realize he is a toy and truly believes himself to be a space ranger. Woody, Andy's longtime favorite doll, has fun picking on Buzz and making him feel unwelcome. Unfortunately for Buzz, Woody was right when he pointed out that he wasn't flying but rather just falling in style. It isn't until Buzz breaks his arm during a failed flight out the window that he realizes he isn't the hero he thinks he is. Pick up this Buzz Lightyear shirt or a Toy Story costume for your favorite fan. In addition to the Arms Crossed Buzz Lightyear tee above, browse the Toy Story Clothing Gallery for more apparel like men's and women's clothes, kids shirts or hoodies.